Northeastern Adam Gaudette celebrated his goal with teammate Nolan Stevens. In 1988, the last time Northeastern University won the Beanpot hockey tournament, Brent Arvidson was a first-year student, cheering on Northeastern from the stands. He didn’t expect it would take 30 years for his team to win it again. 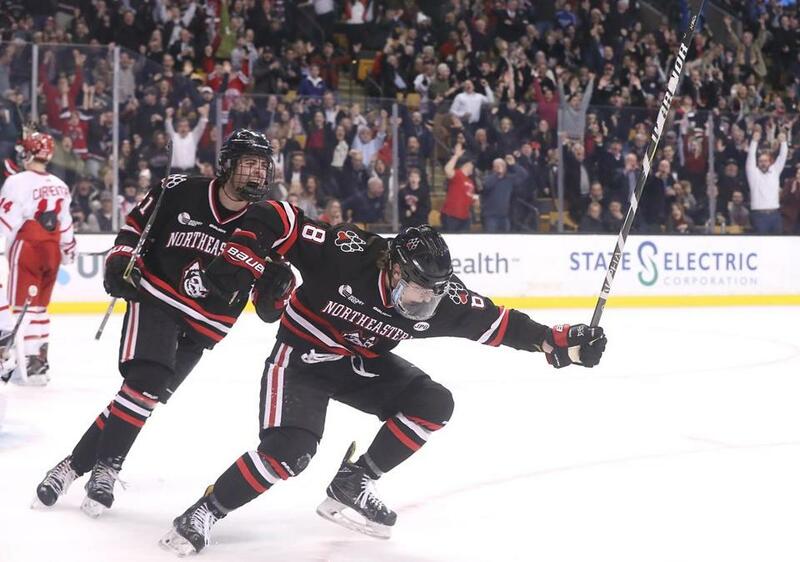 On Monday night, the Northeastern Huskies ended their Beanpot drought, beating the Boston University Terriers 5-2. Outside TD Garden, jubilant fans celebrated the long-awaited victory. Ken Anderson was at the Garden in 1988 and again Monday night. Adam Gaudette scored in each period and Cayden Primeau made 38 saves as the Huskies beat BU, 5-2, in the championship game. Paul Carey, of Stoneham, came to his first Beanpot game in 1961 as an 11-year-old Cub Scout. A decade later, Carey and his twin brother were Northeastern students, and his brother walked onto the hockey team and played goalie. Carey would go to his brother’s games to support the team, at least some of the time. On Monday, Northeastern had its moment. When the Huskies scored the next three goals to take a commanding lead, fans said they were in disbelief. Alana Levene can be reached at alana.levene@globe.com. Follow her on Twitter @alanalevene. Aimee Ortiz can be reached at aimee.ortiz@globe.com. Follow her on Twitter @aimee_ortiz.